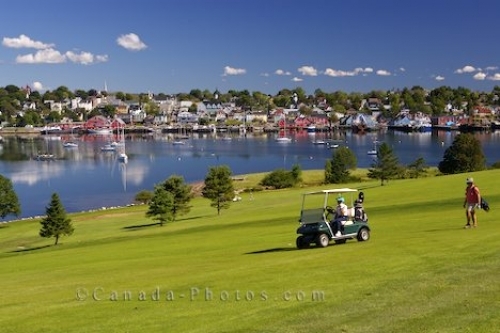 Two golfers, one with a golf cart, the other carrying his clubs playing a round at the Bluenose Golf Club in Nova Scotia, Canada, stop to enjoy the beautiful scenery of the town of Lunenburg. The historic fishing town enlightens the harbour with its bright colored buildings and mass of fishing boats moored in the calm waters. This 9 hole golf course is very challenging as it has sloping fairways with uneven lies, small greens but some of the most picturesque scenery. Before the round, people can enjoy the large full-service practice area and after the game, relax in the full-service clubhouse and enjoy a meal and beverage while admiring the town of Lunenburg. Picture of the scenery along the harbour of the town of Lunenburg, Nova Scotia from a fairway at the Bluenose Golf Club. ... Opened from June to September, the club has an endless list of activities, some which include members only while others are open to the public. View of the town of Lunenburg, UNESCO World Heritage Site, from the Bluenose Golf Club situated across Lunenburg Harbour, Lighthouse Route, Highway 3, Nova Scotia, Canada. Lunenburg was established in 1753.